The children of Robert E. Grings, “Grandpa”, would like you to know that on January 20, 2012 their father passed from his earthly address in Macampange, Congo, to his heavenly mansion on the Golden Streets of Heaven. Jesus made the reservations for this date, paid the price, and made all the arrangements when Grandpa accepted Him as his Savior at the age of ten. He was born in Linga, Congo, on November 15, 1920, and has spent his earthly life preparing for heaven. His treasures are already there, he has nothing of material value here to speak of or worry about. The spiritual legacy he has left is worth far more than anything physical he could have left behind. He is confident his children and most of his grandchildren have likewise put their faith in Christ’s death on the cross and are committed to serving the Lord. Until 2009, when he suffered from a stroke, Grandpa spent his waking hours sharing the Gospel with the Congolese people whom he deeply loved. He traveled this country by foot, bicycle, and vehicle. He suffered with the Congolese people as this country progressed from a colony to an independent democracy. His compassion and deep love for the Congolese people, kept him in this country through independence, uprisings, riots, war, peaceful times and finally failing health. His selfless, generous, humble, gentle, calm, servant’s heart has defined who he is and what he represents to his beloved family and Congolese people and has made him an encouragement and Godly example. As failing health slowly took away his physical strength, never a complaint passed his lips; he remained an outstanding testimony and inspiration to one and all. Grandpa is survived by his sister, Louise (and Darrell) Champlin; three children, Ruth (and Steve) Bell, Rebecca (and Lee) Ward, Dan (and Christine) Grings; Pastor Mosanga (and Charlotte) who has been part of our family since youth; thirteen grand children; twelve great-grand children; and countless other spiritual children. He was preceded in death by his wife Winnie; four siblings, Grant, Roy, Mark, and Bessie. His father and mother, Herbert and Ruth Grings, are also both buried here in the Congo. 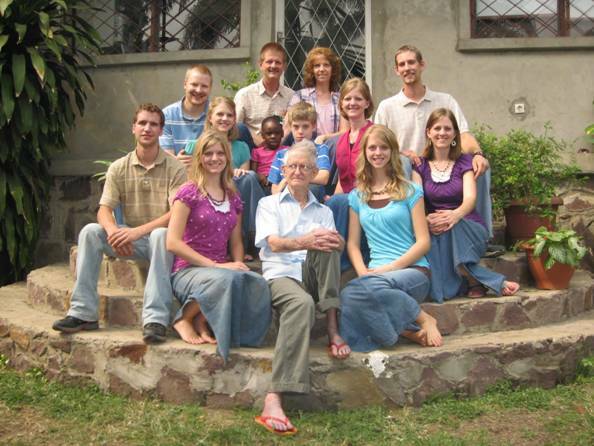 “Grandpa Bob” was loved dearly by not only his family, but also by the Congolese people. He will be greatly missed. I’d rather have Jesus and let Him lead.